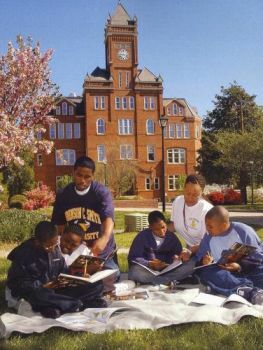 Johnson C. Smith University (JCSU), founded on April 7, 1867, is one of the oldest predominantly African American universities in North Carolina. The university was founded by three Presbyterian ministers, Rev. Samuel C. Alexander, Rev. Sidney S. Murkland, and Rev. Willis L. Miller and established under the auspices of the Committee on Freedmen of the Presbyterian Church, USA. The university was originally for men only. With approximately eight men, the first session of class was held on May 1, 1867. The University offered its first Bachelor of Arts degree in 1876. Rev. Dr. Stephen Mattoon was the first President of Johnson C. Smith University from 1870 to 1886. The first African American President, Rev. Dr. Daniel Jackson Sanders, began his tenure in 1891. Several philanthropists contributed to the early success of Johnson C. Smith University. The institution was first named Biddle University because of the initial financial support of $1,400 provided by Mrs. Mary D. Biddle of Philadelphia, Pennsylvania. From 1921 to 1929, Mrs. Jane Berry Smith of Pittsburgh donated a total of $702,500 for the erection of nine buildings, and the establishment of a permanent endowment. In recognition of her generosity, the University adopted the name of her late husband, Johnson Crayan Smith, on March 1, 1923. Financial support for the university grew dramatically when James B. Duke, founder of the American Tobacco Company, established the Duke Endowment in 1924. While most of the endowment’s earnings supported Duke University, Johnson C. Smith University received 4% and thus became the only Historically Black College and University (HCBU) to benefit from the tobacco magnate’s generosity. JCSU sits on the highest point in Charlotte, North Carolina because of land donated by Colonel William R. Myers in 1868. Biddle Hall, JCSU’s oldest building, occupies part of the original eight donated acres. In 1932 Johnson C. Smith University became the first African American college in North Carolina to receive regional accreditation by the Southern Association of Colleges and Schools. That same year it accepted women students for the first time. In 1938, JCSU became an independent university when it was released from the Board of National Missions of the Presbyterian Church. Today Johnson C. Smith has approximately 1,300 students and offers 27 different majors. The university’s service learning component, which combines academics and community service, has become a national model. Extensive career development opportunities abound through co-op programs and internships with more than 90 companies. Some of Johnson C. Smith’s most prominent graduates are Dr Henry Hill, the only African American to become President of the American Chemical Society, Congresswoman Eva M. Clayton, the first African American woman to represent North Carolina in the United States House of Representatives, Edward R. Dudley, an ambassador to Liberia, Captain Thomas H. McPhatter who led African American Marines at Iwo Jima in World War II, and Fred “Curly” Neal, a longtime athlete with the Harlem Globetrotters. JCSU made sports history on a snowy afternoon on December 27, 1892 when, still known as Biddle University, it played Livingston College in Salisbury, North Carolina in the first intercollegiate football game between two African American institutions. Biddle, which was ahead 5-0, was declared the victor after snow completely covered the field. Arthur A. George, Down Through the Years: Some Personalities Connected with the Establishment and Growth of Biddle University, now Johnson C. Smith University, Charlotte, North Carolina (Charlotte: Johnson C. Smith University, 1961); Arthur A. George, 100 Years, 1867-1967: Salient Factors In The Growth and Development of Johnson C. Smith University, Charlotte, N. C.: A History (Charlotte: Johnson C. Smith University, 1968);Inez Moore Parker, The Biddle-Johnson C. Smith University Story (Charlotte: Charlotte Publishing, 1975). with the Establishment and Growth of Biddle University, now Johnson C.
Smith University, Charlotte, North Carolina (Charlotte: Johnson C.
University Story (Charlotte: Charlotte Publishing, 1975).